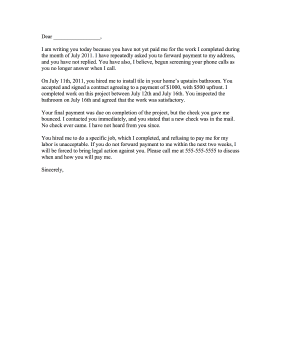 Current or former employees can use this printable complaint letter to request their paychecks from an employer. I am writing you today because you have not yet paid me for the work I completed during the month of July 2011. I have repeatedly asked you to forward payment to my address, and you have not replied. You have also, I believe, begun screening your phone calls as you no longer answer when I call. On July 11th, 2011, you hired me to install tile in your homeÕs upstairs bathroom. You accepted and signed a contract agreeing to a payment of $1000, with $500 upfront. I completed work on this project between July 12th and July 16th. You inspected the bathroom on July 16th and agreed that the work was satisfactory. Your final payment was due on completion of the project, but the check you gave me bounced. I contacted you immediately, and you stated that a new check was in the mail. No check ever came. I have not heard from you since. You hired me to do a specific job, which I completed, and refusing to pay me for my labor is unacceptable. If you do not forward payment to me within the next two weeks, I will be forced to bring legal action against you. Please call me at 555-555-5555 to discuss when and how you will pay me.